In a very peaceful, small and exclusive development. This front-line beach apartment is walking distance to the Kempinski hotel and nextto Laguna Village. The qualities are first class with hydro massage baths, jacuzzi, travatino marble and granite kitchen surfaces. The apartment is to be sold fully furnished. 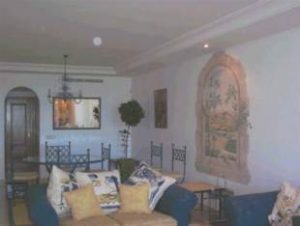 An immaculate, beautifully decorated and furnished apartment in a prestigious development which has 24 hour security, gym jacuzzi etc. The apartment looks over the sub tropical water gardens and cascade pool to the sea. 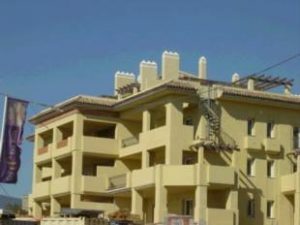 The development is situated close to the five star Las Dunas Hotel with it´s many amenities. This superb 2 bedroom five star corner apartment is built to the highest of standards. South facing it offers views over the Golf course, the Mediterranean Sea, Gibraltar, the Atlas Mountains of Africa and the Swimming Pool. 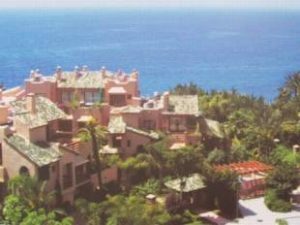 The development offers a private setting with tropical gardens, 2 swimming pools and a water fall feature in secure grounds. The apartment comprises of 2 bedrooms, two bathrooms , lounge / dining room, kitchen, storage space and large terrace at rear with access to main living room and main bedroom a small terrace off the 2nd bedroom to the front of the property. Garage space included in purchase price. 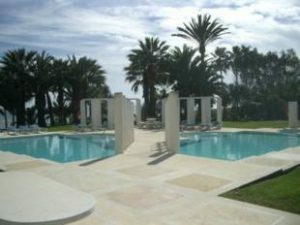 2-bed, 2-bath apartment in an luxurious complex with sauna, gym, indoor pool and two outdoor pools. Very close to the beach. Excellent rental potential. Underground parking and store room. 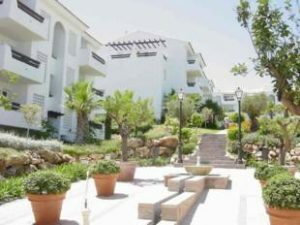 Large 3 bedroom corner apartment with great views to the sea and coast. This apartment boasts a large corner terrace complete with jacuzzi, ornate fireplace, open kitchen with granite finish and 2 swimming pools with landscaped gardens. 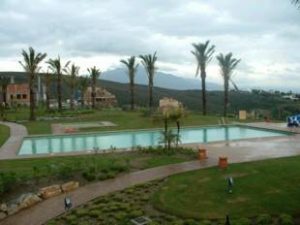 Directly next to the Resina Golf course and Selwo Safari park. This vendor is desperate to sell hence selling well below current price. Great investment! BARGAIN! An Andalusian-style terraced pueblo of 110 apartments. A private health centre with gymnasium, sauna and changing rooms as well as two swimming pools. Price includes fully furnished kitchen and air conditioning, garage and storage room. Apartment, Close to Golf, Furnished, Fitted Kitchen, Parking: Ample Garage, Pool: Communal Pool, Garden: Community, Facing: East and West Views: Garden, Pleasant, Pool, Trees, Urbanization. Features: 5-10 minutes to Golf Course, 5-10 minutes to shops.